Last week and by some coincidence, It was noticeably Thai in the palate. Last Sunday, my friend Frankie, while catching up, introduced me to Som's Noodle House, relatively an open secret place to foodie on where to get close to eating authentic Thai cuisine that is also good for the pocket. I managed to research online mostly on directions since Frankie directed me to go straight to the place. I learned that it is located at the 'backwell', likod ng Rockwell, on Alger street. I did not have the hard time looking for it though. The cab driver was competent enough to know the sense of the direction and the place. At first sight, Som's Noodle House is your friendly neighborhood Thai canteen. Plain interiors and no frills. It happened that there were also few people on this Sunday. But during the later part, we noticed the place was almost 3/4 filled with late 'lunchers'. And the food, we ordered Tom Yam, Green Chicken Curry and this 'tonto' fish that Frankie kept mentioning. The Tom Yam was full. Coconut was dominating the chicken curry. Is there a difference between a gata and a curry taste after all? The fried tonto was average. Yet we devoured with much gusto! I have yet to come to terms with the taste at Som's or even more, the Thai cuisine. For one thing, they are predominantly spicy. 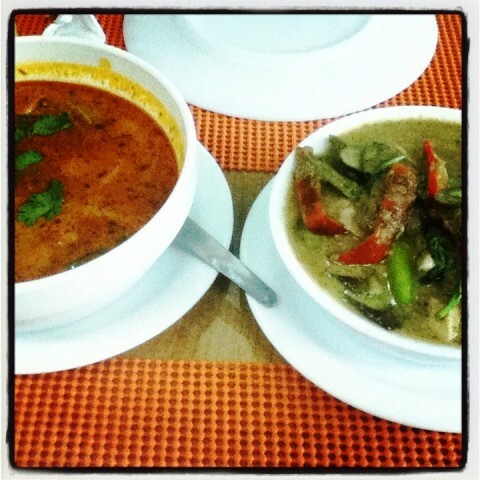 I have a fascination for Thai cuisine not because of its taste but how it really stands out in the world cuisine. They can market well and they bring out the brand. 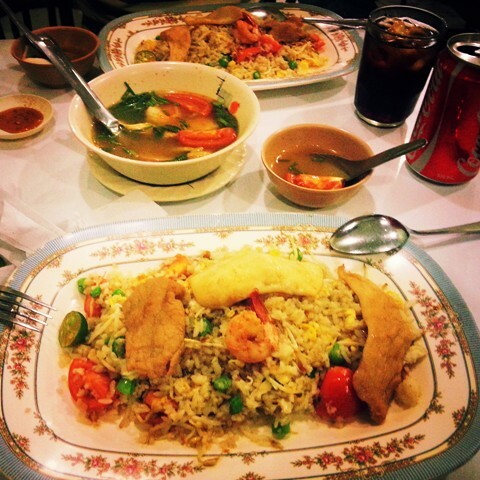 But to think about deeply, Filipino food can very well compete against the Thai food. Som's is above average. Last Friday, Sei broke a good news and I urged him to see me near our alma mater for a Friday night chat since I will be coming from an official activity nearby. Any good old Thomasian especially in the early 2000s would look for Almers. But we found the place closed at early 7:00 pm (probably because there is still no class. we even suspected it may be closed already since we found no signs). So we looked for other restaurants. I am surprised there is still SR Thai. During our college, SR was not as famous but it managed to have student following. Still, a humbling canteen feel. A big King Bhumibol poster was at the back of the lolo cashier, noticeably also Thai because of his accent makes you feel you should recognize that you are in a Thai eatery. Another round of Tom Yam. I noticed it is more spicy than Som's but it somehow lacks the richness of it. The soup is not bland but you can see the veggies swimming in a clear broth. Its Seafood Thai Rice comprises of thin slices of squid, a shrimp, and a pork (?) on top of a slightly greasy fried rice. It is still a student meal, if you ask me. So I cannot expect that much. But it is enough to fill in your tummy. I look forward to eating and exploring more Thai foods. I believe they are even healthy. It is nice to know that Thai restaurants abound these days. It only means Filipinos appreciate the cuisine of our neighbors. And we keep open to exploring new tastes. We Filipinos love to eat anyway.